President of the Nigeria Football Federation (NFF), Amaju Pinnick, has revealed how he and his board consulted Arsenal manager, Arsene Wenger, when they needed a new handler for the Super Eagles. Pinnick disclosed this during the launching of the short code *1945#, a campaign by the NFF ahead of the 2018 FIFA World Cup which was held in Lagos on Monday. During his speech at the event, he also gave an insight into how Nigeria were able to qualify for the 2018 World Cup in Russia. “It has been a tortious journey. Remember we did not qualify for the last two Nations Cup,” Pinnick began. “And as head of the federation, we always want to take responsibility, we don’t want to apportion blame. We don’t want to tell the world that Chad pulled out last meeting, that a country, that won the AFCON back-to-back, are even more eager. After we decided that we were condemned to qualify for the World Cup. “So what did we do? Between the three of us; Shehu Dikko, Seyi Akinwunmi and myself, we held series of meetings in my house and we looked at the A to Z of everything that could be an impediment to our qualifying for the World Cup. "We looked at the politics of the game. We looked at the welfare of the players. We looked at the technical crew. We looked at so many things. “Before I had my ambition of going to CAF executive, I remember Seyi told me that whether I thought if Issa Hayatou was there we would qualify? For two nights I slept and was thinking about it. Cameroon was in our group, and this was a man who was 71-years-old and possibly if he wins the election, it will be his last time and could be a parting gift to Cameroon off the field. "We looked at Algeria, they had the best record, they had gone about 13 games unbeaten. We looked at Zambia, AFCON winners. And I saw in the history of World Cup qualifier, the group that we were in, it was the toughest group ever in the history of the World Cup qualifiers any where in the world. Having three of the countries at the last World Cup in Brazil and also four AFCON winners with very rich form. We looked at all these and said we must overcome this. "First thing we did was getting a coach. Of course. We all remember the name of the first coach Paul Le Guen. To us it was a blessing in disguise because when we decided again that we wanted a coach, and everybody know that I am an Arsenal supporter, we tried to reach out to Arsene Wenger for a consultation on a coach. We tried to reach out to Gerard Houllier (former Liverpool and France coach). 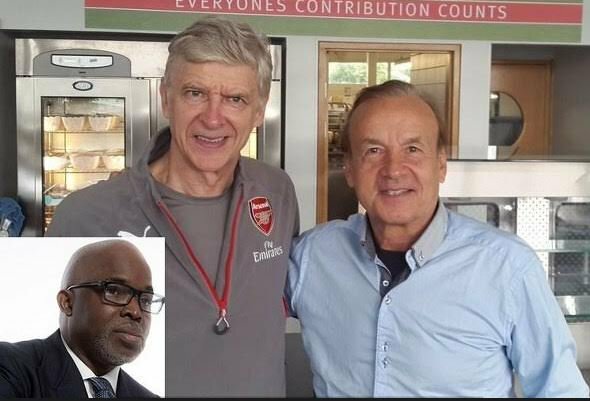 I reached out to so many coaches and technical experts, and one name came to their fore and that was Gernot Rohr.